This week I'm going meat-free and eating delicious, flavourful vegetarian food has become an exciting project to work on. I walked up and down the aisles of my local grocery store looking for inspiration and found it in the international foods aisle where my eyes happened to rest on panko crumbs. They are so easy to work with and add an instant crunch to whatever you're working with. 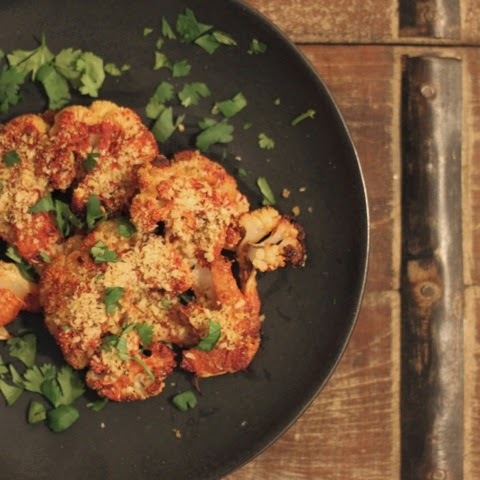 This recipe for masala panko crusted cauliflower steaks will be sure to please the most skeptical vegetarian, but as it really brings the heat--don't be afraid to dial down the amount of spices if you are into a more milder flavour or pair it with something cooling like a cucumber-yogurt dip. Enjoy! Mix the spices, oil and lemon juice. Cut cauliflower into 1 inch thick steaks and baste with the masala mixture and spread them out on a baking sheet. Roast in the oven at 375 degrees for 20 minutes or until the cauliflower is tender. Sprinkle Japanese-style panko crumbs on the cauliflower steaks, creating a crust. Continue to bake the cauliflower for 5 more minutes, carefully watching to make sure the panko is crisp but not burnt. Enjoy and serve with cucumber yogurt dip, corriander chutney or as an accompaniment to a salad.